A journalist is being threatened with imprisonment if he does not reveal the name of an informant who says a British submarine may have sunk a Hull trawler. Graham Smith, an internet journalist from Leeds, has a recording of a naval chief petty officer making the claim. It is thought the nets of the Gaul, which sank in 1974, may have become ensnared on the submarine, and the boat dragged under water. Mr Smith has been issued with a summons to appear before treasury solicitors. In the tape, the naval officer said he overheard a conversation in which another officer claimed he had been aboard a Polaris submarine which accidentally sank the Gaul. "They had been tangled up in the nets of a trawler which he specifically named as the Gaul," he said. "Trawlers are very difficult to detect and if it happened that way it was just a seriously sad combination of bad coincidences." The government has demanded to know the name of the chief petty officer, but Mr Smith, of Mediaworldnews, says he is prepared to protect his source. "I would not name the chief petty officer in any circumstances unless he decided he wished to be named," he said. "At this stage however he does not wish to speak to the Wreck Commissioner or the treasury solicitors." 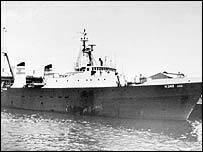 The Gaul sank in the Barents Sea on 8 February, 1974, without sending a mayday call. None of its 36 crewmen survived. A six-week public inquiry into the sinking of the vessel ended in February. The Wreck Commissioner, Mr Justice Steel, is expected to publish a report of his findings later in the year.